Last year, I bought a Diverge, which Specialized calls an "adventure road" bike. It's much, much faster than any bike I've previously owned. Here's my attempt to describe our adventures the last four months, as together we explored the laws of physics. But first, the obvious. The thing is, I can't see how this took so long to catch on. When we were kids, we had a bike. One bike. There were no mountain bikes, so you either had a Raleigh 20, a chopper/grifter (the one that had two different sized wheels and an extremely cool toggle shifter on the top tube), or a "racer". That was your bike, and you just rode it everywhere you wanted to go. A lot of the time you maybe couldn't even call it riding; we were just fannying about, on a bike. Today's bike industry is hugely specialised (small s), with each type of bike designed to fit into a narrowly defined role but perform exceptionally when used just for that; the art of getting better and better at doing less and less. This is partly driven by people wanting to be able to achieve the type of performance that the pros do in a particular race discipline; but the real driver is the bike industry wanting to be able to sell you another, and then another bike. Maybe that's a little unfair; some people do just want to get really, really good at something they enjoy. Great, can I have a lightweight bike now that will carry gear in frame packs over all types of terrain, still go fast on the road, and be actually fun to ride? It's the bike I had when I was fourteen, back again! But now it's 5 grand. Is it? After seeing these things and trying them, I had to have one. The Specialized Diverge, Norco Search, GT Grade and Salsa Warbird are all pretty similar - lowered bottom bracket, endurance-style angles, medium wheelbase, plenty of trail, wider tires, and inexplicably, road bike gearing, but that's another story. I bought the Diverge after painstaking searches turned up an offer I couldn't refuse. In other words, the bike shop down the road was selling off 2015 stock cheap. If you're not a road biker and then take a road bike out for a spin on anything but polished concrete, you'll be struck by the speed of the thing and the roughness of the ride. That, and how unstable the handling is compared to, say, a hybrid or touring bike. Adventure road or gravel bikes like the Diverge filter most of this out, in exchange for a little bit of weight and a little bit of speed. It's a good trade; I can see this thing being really popular just as a road bike because it's so comfortable on poor roads. Rolling along at 30 or 40 on a rough road or gravel, the ride really is very good, considering you're basically on a road bike. The grip is nothing like a mountain bike, but better than most road bikes since the tires are wider. You don't feel in any real danger on most surfaces once you get used to it. Mine came with 32c semi slick tires which are surprisingly good on gravel and hardpack as long as it's dry. I run them 60-70 psi, just in the summer if I'm going for a long road ride. Mostly it runs on 35mm Clement USHs. You can run those at 40 and it's NICE. Er, no. Most of my Revelate bags will fit on easily enough, except the front one (Sweetroll), and it's lightweight, and it will go fast on the road.. but, er, not all at once. It came with 50/34 on the front, and 11/32 on the back. The Shadow Plus clutched rear mech easily took a 36 cog replacement. I'm reasonably confident I'll get a 40 on there. But still that's not really low enough for adventure touring, given the weight, surfaces and grades we have to handle. The problem is the 34 on the front, which is the smallest chainring that will fit on the 5-bolt crank spider. Er, yes, it's five grand. 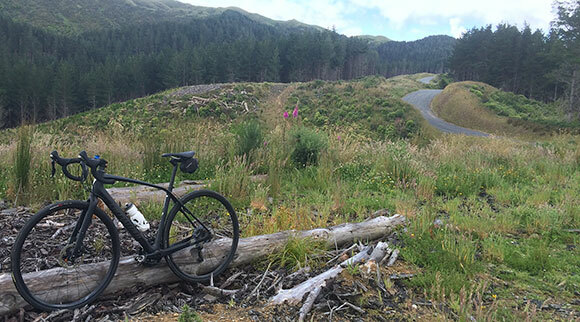 You can get cheaper versions of all the bikes, but the mid-range carbon machines with 105 groupset, which is what I recommend for this type of bike, are all 4-6 grand in New Zealand dollars. And yes, it is the hundred quid bike I had when I was fourteen, just better, in every way. Except for the F117 paint job. Like a good gravel bike, it's a natural road-eater, climbs easily, and doesn't try to kill you whenever you encounter a corner. Like a good road bike, long climbs at shallow gradient just disappear and become flat. Bumps, small stones and debris on the road don't matter as much as you'd expect; you can't feel them nearly as much as on a "normal" road bike. The frame is a real beauty, brilliantly engineered, taking the "angle grinder" out of riding back roads, rail trails and gravel trails. It manages to feel both stiff and supple at the same time, tough down low where it needs to be but with a killer top tube and seat stay design. The alloy Axis wheels are a little heavy but perform really well and have stood up to some pretty major bangs, especially the front one. Likewise the bars which have almost incredible softening - gelpads under the tape help, but on a rough descent with hands on the drops you can really feel the work both the bars and the front end are doing. The Shimano 105 has been flawless and hasn't needed any adjustment so far. Except for the one technical niggle - the noise from the front brake. Under load, it starts making a once-per-rev clicking noise on disengage whenever it heats up. 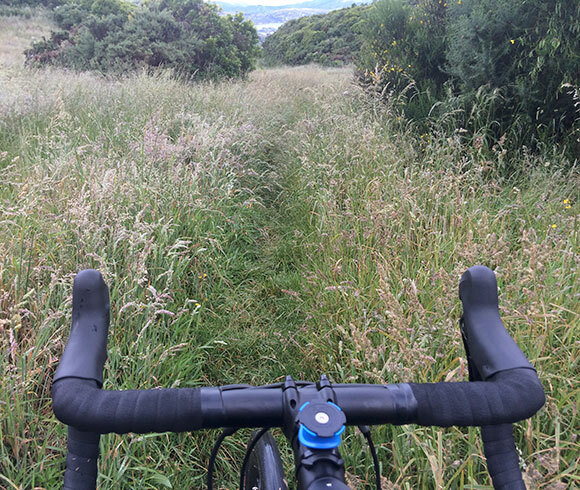 Since we have monster steep hills here, and the brake caliper is 50cm from my head, this can make descending a little unnerving - you're just thinking about it locking up. Three visits to two different LBSs have failed to fix it, but they assure me it's not an issue. Just annoying. The biggest problem is the 50/34 front gearing. I get this is what road cyclists expect, but if you look at the other types of bicycle pictured against the same backgrounds as the Diverge in advertising material... well, they have much lower gearing, don't they. Specialized have actually put LARGER chainrings on the 2016 models. They've lost the plot here, but I hope it's temporary. I reckon that in a year or two the feedback coming to them from people who take this thing into the boonies will direct them to fit more suitable gearing on future models, or make it easier to change. That's probably the answer, because I'm reading that a lot of people are buying adventure / gravel bikes and using them as their only road bike. If you're older, new to the sport, have a bad back or something and need a more comfortable bike that lets you stay out there, I can see the Diverge or Search or Warbird would be perfect. Longer term, I think frame-only options with open bottom bracket standards and wider forks will become much more common as the adventure bike market matures and, ultimately, merges into expedition touring. Think bikes like the Open U.P., Salsa Cutthroat. It's no use for touring. It absolutely won't do what I bought it for - climb over trails in the mountains with all the bags on, and still be fast on the road. Yessir, that's what we want. And it's not an adventure bike. Not with 50/34 on the front. It's not even really a gravel bike; it's an adventure road bike. A road bike you can ride on gravel. But God can you have some fun on this thing. You can't carry much gear on it (unless somebody has found a way to fit an MTB chainring onto a road front end where you can't use a band clamp) but you can make swift progress over the Earth. Any kind of.